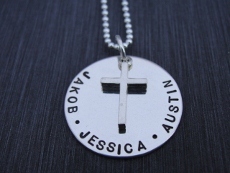 Our family circle necklace is a stylish and sentimental way to wear your family around your neck. Choose from two different size sterling silver discs. The 7/8” disc will accommodate up to 28 characters and the 1” disc will fit 33 characters including dots to separate the names. This necklace comes with a charm. Choose from peace, love you, love mom, paw, cross, floating heart, flat star, or star of david charm. Sterling silver ball chain in 16”, 18” and 20” length are available.